Matrix Multi-location solution for modern businesses offers the flexibility to collaborate all the dispersed offices under a single network. It offers the cost-effective calling between offices and long distance calls. Matrix provides Multi-location Office Telephony solution connecting all branches for seamless communication. 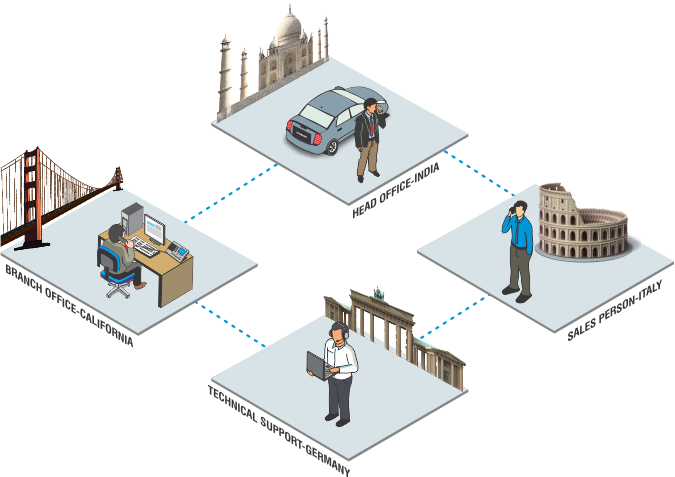 The branches are connected through branch office communication systems via peer-to-peer connectivity, forming a virtual network between all systems. This connectivity provides one-touch calling access to all users for placing calls to colleagues irrespective of their location. This set-up helps in maintaining business continuity with easily accessible contact list of all users and cost-effective communication over secured VOIP network. Matrix IP solution reduces telephony costs and operation all over heads and improves staff efficiency. Matrix IP solutions enable businesses to have location independent communication between different offices using mobile extensions, remote IP extensions and teleworking solution. Matrix IP solutions enable businesses to use their already laid IP and telephony networks and integrate them seamlessly. This reduces the cost of maintaining separate networks for all locations. Based on SIP, all Matrix IP products are virtually interoperable with any SIP based device, service provider and application. Matrix IP solutions allow businesses to take advantage of cost savings of SIP trunking, free intra-office calling through peer-to-peer connectivity and reduced call costs through GSM connectivity. The easy to use and intuitive web-based GUI helps in configuration and management of multiple devices from a single location. The location independent management saves administrator’s time and cost of providing essential technical support. The unified messaging offered by Matrix IP solutions ensures the business continuity in event of the non-availability of a user. In addition, the location independence of IP offers businesses the flexibility of easy and immediate contingency telephony setup as part of their disaster recovery plan.